It goes without saying that until every single baby is safe and secure in his or her own mother’s womb, we pro-lifers have a lot of work to do. But I for one am quite happy to celebrate the various wins we are having along the way. And in the US at least we keep seeing a number of victories which should encourage us all. In a year that abortion businesses attempted to expand in America, the actual number of abortion facilities decreased by 27 clinics over 2016 totals. Closures far outpaced newly opened abortion facilities in 2017. In all, 49 abortion facilities — 35 surgical and 14 medication only clinics — closed or halted abortion services. Only eight new surgical abortion facilities were opened, along with eleven new medication abortion facilities. There was also some movement between categories. Fourteen surgical abortion facilities now only conduct medication abortions, while five medication abortion facilities added surgical abortions. These encouraging statistics and more were verified through an annual survey of abortion facilities conducted by Operation Rescue staff, this year with the assistance of Abortion Free New Mexico. As hundreds of thousands of pro-life people prepare to march in the March for Life, the House of Representatives voted to approve the Born Alive Abortion Survivors Protection Act — legislation protecting babies who survive abortions. The Born-Alive Abortion Survivors Protection Act (H.R. 4712) passed 241-183. All Republicans voted for final passage, but only six Democrats voted in favor of it. House Majority Leader Kevin McCarthy (R-CA) said the bill was necessary to protect babies who are born alive after botched abortions. The president signed legislation — passed under the Congressional Review Act — that allowed states to remove Title X funding from Planned Parenthood over its provision of abortion. Under the Trump administration, the Justice Department announced that it is formally investigating the abortion group for possible involvement in the illegal fetal-tissue-trafficking industry. Like every Republican president since Ronald Reagan, Trump reinstated the largely popular Mexico City policy, which denies U.S. aid money to any international group that funds or promotes abortion. But he took the policy a step further, expanding it to cover nearly all U.S. foreign health spending, not just family-planning funds. The administration also moved to defund the United Nations Population Fund on similar grounds. 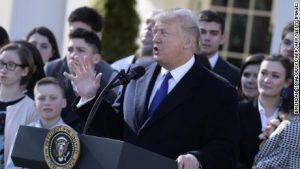 The Trump administration drastically expanded the religious and conscience exemption to the Health and Human Services Department’s contraception mandate, which had been added to the Affordable Care Act to require that employers provide employees with subsidized birth control…. Anti-abortion leaders have rightly been pleased with this progress. But pro-life Americans can’t forget the biggest punted promise of the last year: The government’s inability to defund Planned Parenthood. The Republican party has spent years promising — and failing — to remove federal funding from the abortion group. Congress passed a bill that would have defunded the group a few years ago, but it was vetoed by President Obama. There is no excuse for a similar failure this year, and the pro-life movement must continue to demand that the GOP follow through in the year to come. The March for Life is a movement born out of love: you love your families; you love your neighbors; you love our nation; and you love every child born and unborn, because you believe that every life is sacred, that every child is a precious gift from God…. One could never imagine such words being spoken by an Obama or a Clinton. Thus we have some real reasons to celebrate. The culture of death is by no means over in the US or elsewhere. It is deeply entrenched and will be defended to the death (no pun intended) by its militant supporters, including so many in the media, in politics and in academia. All the more reason for us to never give up, but to keep on fighting. The good news is, 2017 was a pretty good year for life, at least in America. Let’s make 2018 a pretty good year for life all throughout the West – and beyond. Yep and locally we can celebrate that as of last week both Abortion factories in Tasmania have closed. One last year and one this year. Yes that is great news indeed Carlos. I am pro-life, and adoption. This is all great news. In Vermont they allow late term abortions, I would love to see a push to end it in all states. I have heard horrific stories of babies born alive and the nurses could do nothing. I am pleased that at least we are moving forward. Pro-choicers may hate me for my love of life, but aren’t they glad their parents felt the same. The decline in surgical abortions may in part be a reflection of an increase in “medication abortions”. These, at first glance, appear less invasive of a woman’s body than the surgical kind of “termination”. However, no form of abortion can escape the ethical ambivalence of the proceedings in question: When is one human life more valuable than another? What collateral damage is entailed in unnaturally arresting the complex changes to a mother’s bodily systems which begin when her child is conceived? We know that God does not see as man sees, nor does He choose perfect people to do His work. Of all the unlikely candidates for the presidency Trump takes the Palm D’Or, but God has permitted him to take that high office and we can be sure that God has far more than a hand in what is happening. To God be the glory !!! Hopefully overtly pro-life president and vice-president will help shove the Republican Party into doing more about abortion. The heinous practice could have been slapped down as fast as the Supreme Court imposed it if there had not been so many political quiselings. It’s more than obvious now that giving way to the DemoRats on the abortion issue, or any other libertine wedge issue, did not gain the Republican Party anything. American Conservatives have also seen how often the libertine Republicans, who pander to garner votes, are election losers with no statistical advantage over real conservatives. I have noticed that Establishment drones who want us to pander never present any statistics to back up their pandering inclinations. The DemoRats and other social anarchists will always come up with the next perversion to push as a wedge issue. So long as parents send their kids off to be brainwashed, the Dem propaganda on wedge issues will keep working. It’s inevitable. Bravo President Trump – and thank you, on behalf of the most vulnerable human beings of all, the unborn! May we all be faithful in praying for President Trump – that he will seek the Lord’s guidance in every decision he makes, and pray for the Lord’s strength and wisdom and protection for him. There is great media coverage on child abuse which is to be encouraged. However there is little coverage on the ultimate in child abuse which is abortion. Great news story Bill, thanks for highlighting these good events that have been taking place especially in the USA. I was absolutely stunned to hear the words Donald Trump spoke at the March for Life – this man have a lot of guts. I am starting to believe he will go into history as the greatest president America ever had. In my opinion he has already reached that status. Just wait for his second term, and we start seeing more great work of his. Looking forward to many more great reports you can pen about this great man that made America great again.